Probably the biggest PR stunt of 2014 so far. Samsung’s PR stunt involved a smart phone, Ellen Degeneres and a host of famous faces. The selfie quickly broke the world record for the most retweets (3.4 million, with 1.9 million favourites) and spawned a popular meme, with everyone from The Simpsons to Grumpy Cat replicating the shot. 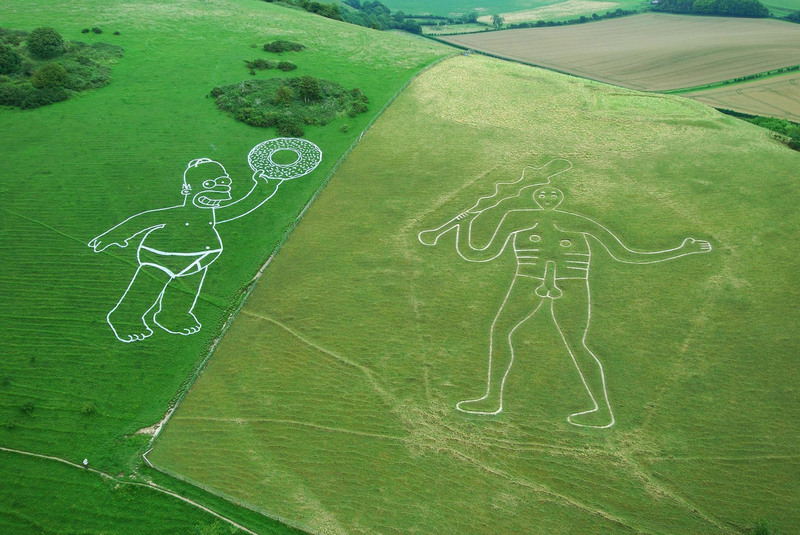 To promote the 2007 Simpsons Movie, a 60 metre long, underwear-clad Homer Simpson was erected alongside the Cerne Abbas Giant in Dorset. KFC pulled off the coup of being the world’s first brand visible from outer space when it unveiled its record-breaking 87,500 sq ft logo in 2006. The event, which took place in the deserts of Area 51 marked the official reveal of the brand’s new re-image campaign that sought to contemporise over 14,000 stores in over 80 countries around the globe. Consisting of 65,000 tiles, the stunt generated global coverage and drove international awareness of the company’s rebrand. The most expensive stunt in today’s list, the Red Bull Stratos is also the most successful. Austrian Felix Baumgartener became the first skydiver to reach the speed of sound when he jumped from a balloon 24 miles above New Mexico, reaching a top speed of over 833.9 miles per hour. The live broadcast set the highest ever concurrent viewing figures on YouTube, at over 8 million, with a further 36 million people re-watching the event on Red Bull’s dedicated YouTube channel. The event also spawned 3.1 million tweets and reinforced the energy drink firm’s association with high-profile dare devil promotions. From the great to the grand. The Gromit Unleashed trail sought to generate funds for Bristol’s Children’s Hospital through the Wallace and Gromit Grand Appeal. The scale of this stunt astounded those who were involved, with 1.2 million people participating in the trail and more than £77 million raised for the charity. However the effects of the event reached much wider, contributing a staggering £120 million to the Bristol economy and attractive visitors from as far away as Australasia. For more information on Gromit Unleashed’s success, check out Skwigly’s summary. ← Is the future virtual?